This farming technique focuses on utilising resources optimally to improve the quality and quantity of crops while lowering the cost of production. At first glance, Nimbol, 400 km away from Mumbai, seems like any other agrarian village in Maharashtra's Jalgaon district . It has narrow, dusty lanes. Its houses are simple, tin-roofed affairs. And its farmers turn out in white, from the topis on their heads to their kurtas and trousers. Go further inside the village, however, and you enter a different world - one with big bungalows, big cars and modern amenities. This is new Nimbol. B.V. Patil, a village leader and President of the All India Banana Growers' Association, explains how the village acquired its split personality. "Until a few years ago, we, too, used to live in tin-roofed houses. And then, precision farming happened. Our incomes rose and we built large houses on the other side of the village." Cross the Tapti river, which cuts through the district, and the story is pretty much the same. Most Jalgaon's farmers owe their prosperity to precision farming, an agricultural method first tried out in the district in 2002/03. This technique focuses on utilising resources optimally to improve the quality and quantity of crops while lowering the cost of production. It reduces fertiliser and pesticide use, prevents soil degradation, utilises water optimally and raises productivity. Globally, this is done with the aid of modern, eco-friendly farming practices and technology, including satellite imagery and information technology. "This innovation can go a long way in tackling many of our country's farm ills, including excessive use of water and other inputs, which has hurt soil quality apart from making farming unprofitable as a profession," says leading agricultural scientist M.S. Swaminathan, Chairman of the M.S. Swaminathan Research Foundation. "Precision is a desirable quality that has been missing." Indeed, traditional Indian farming has at best been ad hoc. Seeds are strewn across fields in random fashion with no consideration as to how many plants will grow in a given area. Irrigation depends mostly on the monsoon, and where water is available, it is flooded into the fields. Fertilisers and crop protection chemicals are used excessively, killing the soil's productivity. Grade I quality crop produced: 90%"
Weight gained by fruit & vegetables: 25%"
"This type of imprecise farming has affected productivity," says Alok Adholeya, Director of The Energy Research Institute's (TERI) Biotechnology and Bioresources Division. He mentions a single statistic. "Farmers in the United States produce seven times more wheat per acre than those in India." However, it is difficult for Indian farmers to adopt precision farming because of the high cost of technology and because, for the most part, farm holdings in India are highly fragmented. What Jalgaon's farmers have done over the last decade, with some help from companies such as Jain Irrigation Systems, is adapt precision farming practices without depending on satellite imagery and the like. Jugaad, if you will. "The Indianised form of precision farming basically tackles input issues," says Adholeya. For instance, Vasantvishwanath Mahajan, a farmer from Tandalwadi village in Jalgaon district, makes it a point to ascertain how much fertiliser the soil will need before planting his banana crop. "We must know the quantum of nutrients the soil has. The amount of fertiliser I use will depend on the test results. I only replace nutrients used up by the previous crop,'' he says. In Chinchkheda village, 25 km from Jalgaon town, Kiran Sriram Patil takes great care while planting BT cotton seeds over his 16-acre farm. "We need to know how much to plant in an area to get the best yield. For BT cotton it is 4,000 plants per acre. Spacing between plants is also important," he says. Precision makes the difference. "Each crop has a different geometry. You plant less, the yield is less. You plant more, the yield still falls due to crowding," says Anil Dhake, Vice President, Agri Research and Development, Jain Irrigation Systems. Raju Ramdas Patil, a native of Neri village near Jalgaon, spends a lot of time assessing the threat to his crop from pests. "Earlier I would spray pesticide without taking the kind of pests into consideration. It was a waste," he says. "Now I look at the leaves and stem for symptoms and spray pesticide depending on the extent of the attack. I have saved money and my farming has become eco-friendly." The money saved, along with his added income has enabled him to build a large farmhouse and fulfil his long-cherished dream of owning a house in Pune. In India it is the soil rather than the crop that is irrigated. As a result, 70 per cent of the water is wasted, says TERI's Adholeya. Precision farming, however, relies on drip irrigation. "With drips, we just wet the soil near the roots. How much water we use is determined by the climate, soil type, crop type and age," says Mahajan. The drip system is also used to "fertigate" the crop - disseminate soluble fertiliser - and the extent of fertiliser used depends on the soil's need. When he did things the traditional way, Sriram Patil harvested eight quintals of cotton per acre. Today, thanks to precision farming, his output has risen to 35 quintals an acre. Patil has built a 1,500 sq. ft. house, purchased a tractor, and leased 25 acres of farmland. Mahajan's banana yield has more than doubled, and so has his income. He has bought 30 acres of land, built a threestoreyed house, and indulged in a four-wheel-drive jeep. The story is the same across many parts of Jalgaon district. 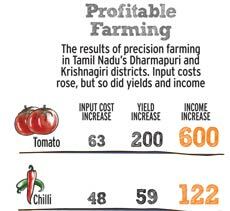 Hundreds of miles away in Tamil Nadu's Dharmapuri and Krishnagiri districts, precision farming over 1.75 lakh acres has delivered significant improvements in yield and income (see Profitable Farming). Initially, the concept was introduced to the region through a Tamil Nadu Agricultural University project (TNAU). After a detailed study of the TNAU project, the London School of Economics termed it India's second green revolution. The new farming method also addresses another challenge, the diminishing presence of youngsters in the field. The National Policy for Farmers, placed in Parliament in November 2007, says "making farming intellectually stimulating and economically rewarding" is a priority. "A National Sample Survey done a few years ago indicated that 45 per cent of the farmers want to quit agriculture as the next generation is disinterested. 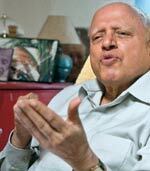 Precision farming can help to change this," says Swaminathan. Indeed, it is already helping. For instance, Vaibhav Patil, a 26-year-old business administration graduate from Nimbol, has taken to farming. "I earn more than my friends, who work in IT companies. This form of agriculture is quite challenging and satisfying." Given its benefits, precision farming should have spread like wildfire across the country. But it still has a long way to go. Rough estimates suggest that only 2.5 million of India's 120 million farmers practice it. The need is all the greater given the pressure the farming sector will face in coming years. It is estimated that India will need to produce 480 million tonnes of foodgrains by 2050. That is double the 241 million tonnes produced in 2010/11. A more enabling environment could help, say experts. "Incentives to tackle initial capital costs and flexibility in the banking system to provide the higher working capital precision farming needs is critical,'' says TERI's Adholeya. The government also needs to create an enabling environment that will trigger development and adoption of technology, he adds. "Technology can help take precision farming to the next level." Swaminathan, acknowledged as the father of India's Green Revolution, puts it best: "Precision farming is a way to achieve an evergreen revolution." It is about as thick as a strand of human hair. But its presence in the soil increases crop yield by up to 25 per cent. It also re-energises dead soil. It helps plants assimilate water, minerals and other nutrients. Mycorrhiza, as it is called, is a fungus which once occurred naturally in Indian soil, but the rampant use of chemical fertilisers has almost wiped it out. In the last decade, however, scientists at The Energy and Resources Institute (TERI), Delhi, after years of research, have succeeded in cultivating Mycorrhiza. 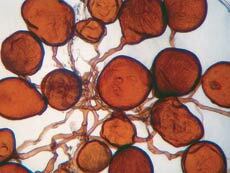 Their process has since been commercialised and six Indian companies now produce and market the fungus. It can be used to stimulate the growth of a variety of crops such as wheat, potato, onions and garlic. Its use is already making a difference. In Krishna district of Andhra Pradesh, for example, farmers in a 30,000 acre area - supplied Mycorrhiza by KCP Sugar and Industries, one of the companies licensed to market it - have registered a two tonne per hectare increase in yield, while their use of chemical fertilisers has fallen by 25 per cent. With agricultural productivity in India still comparatively low, Mycorrhiza can be of immense help to farmers in raising output. The country also has 55 million hectares of fallow land and wasteland which can be reclaimed with its help. Mycorrhiza has even been adopted overseas - it is one of the first bio-system technologies that went to the United States from India. Indeed farmers in the US and Europe have been a lot quicker than those in India in using it on their farms.